Hey friends! Halloween is over. In case you didn’t know. Or are you in some sort of sugar coma? I know you’re expecting a crazy sweet dessert using up all those leftover candies that you have been munching on, one by one, every hour. But I thought instead I would give you a dinner recipe! It’s been awhile since I shared a delicious dinner idea with you all! Don’t worry I’ll be back with some treats soon!! So let’s get to it! This recipe started out with every intention of being a white chicken chili. But then it occurred to me, my family hates beans. Anyone else have this problem? All four of my kids, and my husband, hate beans. It’s quite a problem. So, I decided to play around with this and give you a hearty chicken and rice soup instead! I hope you enjoy this as much as we did! Serve it up with my favorite garlic knots or cheesy onion beer bread! 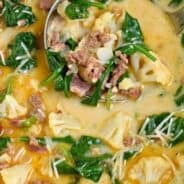 **soup will thicken as it sits, so eat immediately for best flavor and texture!! 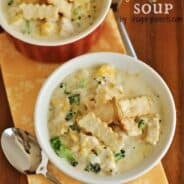 If you like this Chicken Soup recipe, you may also enjoy these soup recipes…. In large soup pot, heat olive oil. Add chicken and cook until browned, about 10 minutes. Add green chilies, broth, rice, cumin, salt, pepper and garlic powder. Cover and simmer on low heat for about one hour, until rice is thoroughly cooked (stirring occasionally). 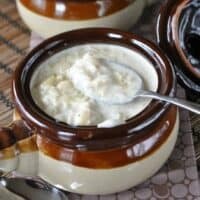 Mix in heavy cream and sour cream, cover and heat on low for an additional 15-20 minutes. Season with more salt and pepper if necessary. Serve and enjoy! We actually love beans but anything creamy and hearty like your recipe is a winner here. I never used to like beans, but now I do! Maybe they will change their minds one day too 🙂 This looks really good – warm and comforting! I guess there’s hope for them, although my husband is a lost “bean” cause!!! Thanks for stopping by Stephanie! 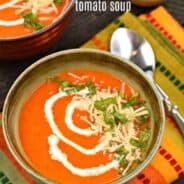 This looks like a great soup to add to my rotation..we are huge soup addicts in my house! Yum. Oh no – they don’t like beans!? But they’re so good! 😉 This looks like an awesome solution for a version without beans – I’ll definitely have to try it. YUM!!! 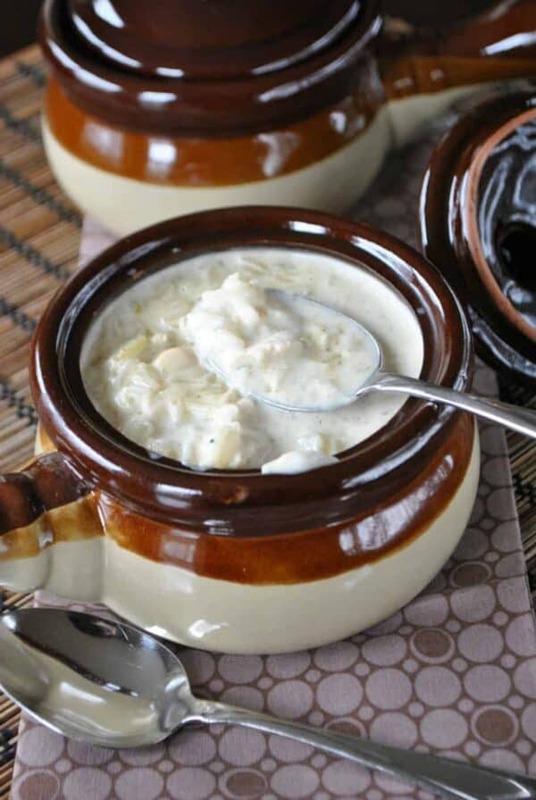 I love white chicken chili…with the beans:-) Yours looks so rich and creamy…perfect for a cold winter night. I gotta try this one for sure!!! If I were the only one eating this soup I would have totally added beans! ENJOY! Oh man, this looks soooo good. It’s almost like my favorite sour cream chicken enchiladas, but in soup form. I’m not sure about the rice, but I suppose you need some kind of carb in there as a filler. I’m definitely making this next week. Love how rich and creamy this looks! Definitely adding this to our soup rotation! Thanks Sues! Hope you try it! I cannot wait to make this. It looks so delicious. This looks great, I’d like to try yin with wild rice too!